George Orwell in his classic novel Animal Farm wrote All Animals are Equal but Some are More Equal Than Others. If this could be paraphrased to read All Teams are Equal but Some are More Equal Than Others then Orwell could have been talking about the all conquering Kenya Sevens team. It really does not matter how much this team achieves, they will never get the rave attention soccer gets. Barely two weeks ago, nearly everybody went gaga because Nigeria were in town. Never mind they are not as Super Eagles as they used to be. Our Harambee Stars had a mission to clip the wings of the eagles before they could soar so high. Look at the kind of incentives they were promised! The irony is, Harambee Stars were ‘trying’ to qualify for the World Cup. They were showered with promises of hard cash should they overcome Nigeria. Suffice to say Harambee Stars were dimmed by the Eagles. They are not going to the World Cup! But, Kenya Sevens rugby will be in Moscow for their third World Cup appearance. You may have thought this could have caused a stir in a country which prides herself in producing (and exporting) some of the best athletes! You are wrong. Kenya Sevens team are only valued by their esteemed fans.They are perhaps the biggest tourist attraction worldwide if the number of fans who jam the stands to watch them display their skills can be used as a yardstick. These fans spend millions of dollars just to see these 12 or so players dazzle and often upset some of the biggest names in the shorter version of the game. The team left on Sunday for an intensive training camp in Aldershot, England. They then proceed to Russia for the World Cup Sevens where they have been grouped together with Samoa, Zimbabwe and Philippines. 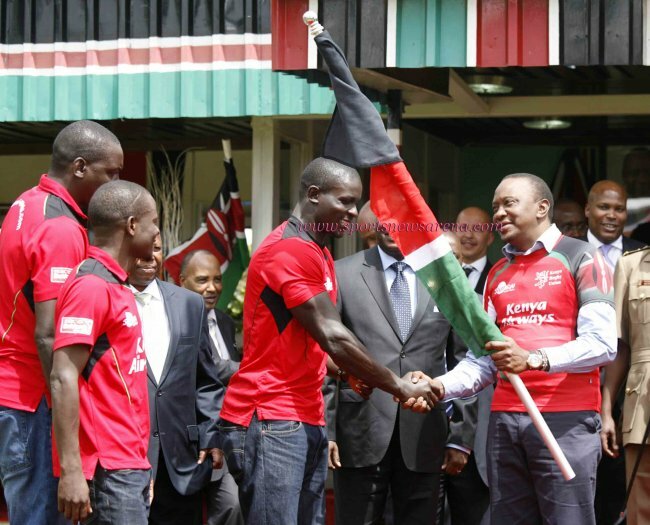 With the right connections, the team were handed the flag by President Uhuru Kenyatta who promised a token Sh25,000 to each player should they reach the quarterfinals, double the amount for a semi-final and Sh100,000 for final. This was a modest gesture even though it was a fraction of what he promised Harambee Stars if they beat Nigeria. Gone are the days when a visit to State House would mean a definite windfall. At press time, no more offers came Kenya Sevens way! What more does the team need to do to gain rave recognition by the ‘leaders’ who joined the Harambee Stars bandwagon? Maybe, there is a feeling the rugby has a lot of money. Wrong. Some KRU officials have had to chip in when player allowances are delayed from the source. Finishing fifth in the IRB World Sevens Series is no mean achievement especially above teams who have abundant resources at their disposal. The late South African reggae musician Lucky Dube sang: We take so many things for granted, One Day it will all be taken away from you, That’s when you’ll realize, How important it was, You never miss the water, till the well runs dry! The body language by Andrew Amonde, the team captain during an interview with a local TV station spoke tons about what was unspoken. It spoke of the unsung heroes who put their bodies on the line for a country who appeared to have forgotten them! The team does not play for rewards but whenever they step on the pitch, Kenya’s name is at stake. Every win or loss is for Kenya. So, are we going to wait till the well runs dry before we give the sevens rugby team the accolades they deserve? Maybe the thousands of fans should just own this team which they love so much and give them the incentives they so deserve.